An increasing number of employers offer 401(k) plans with unique features. One of those unique features is the ability to make after-tax contributions -- distinct from and in addition to Roth 401(k) contributions. After-tax contributions and how to utilize them as part of your overall retirement strategy can be confusing. The purpose of this article is to summarize the different contribution options that are possibly available inside of your employer’s 401(k) plan, and then identify the unique planning opportunities after-tax-contributions provide. *Not every 401(k) plan allows Roth 401(k) deferrals to their plan, still fewer allow for after-tax contributions. Please check with your employer for more details on your 401(k) plan. With pre-tax contributions, you receive an immediate tax benefit for every dollar that is contributed into your 401(k) plan (in effect, the contribution is not taxable1). Income taxes are paid when withdrawals are made. If withdrawals are taken prior to age 59½, you are generally subject to income tax as well as a 10% early distribution penalty on the entire withdrawal. Pre-tax contributions are also subject to required minimum distributions once you turn age 70½. Alert: In our opinion, required minimum distributions are a critical element to retirement income plans that often get overlooked. With Roth 401(k) contributions, you pay ordinary income tax today1 on every dollar invested. The funds grow tax free and can be distributed tax free after age 59½. If distributions occur prior to age 59½, you will be subject to ordinary income tax and a 10% penalty on the gains earned from the already taxed1 contribution. With after-tax contributions, you pay income tax on every dollar invested. The funds grow tax free and upon distribution you pay ordinary income tax on gains and receive your contributions back tax free. Penalties on gains apply to early distributions (before age 59½). Likewise, penalties will apply to required minimum distributions that were not taken based on the gains. IRS guidelines for 2018 allow participants to contribute up to $18,500 if you are under age 50 to any desired combination of pre-tax and Roth 401(k) contributions. If you are age 50 or older, you are eligible for another $6,000 in catch-up contributions for a grand total of $24,500. Alert: You may split your contribution percentage between Roth 401(k) and pre-tax, but the total cannot exceed previously-stated, maximum contribution limits. You may be wondering why your employer offers after-tax contributions when, at first glance, their tax benefits are the least compelling of the three available options. Here’s why: an IRS guideline titled Section 415(c)(1)(A) allows total contributions to your employer’s 401(k) plan to total $55,000 in 2018 for individuals under age 50, and $61,000 for individuals age 50 or older. This limit applies to your contribution, your employer’s match, and any profit sharing that your employer may provide. She contributes 25% of her $100,000 income to the pre-tax option in her 401(k) plan, effectively maxing out her IRS contribution limits. $61,000 Section 415(c)(1)(A) limit minus $24,500 pre-tax contribution minus $3,000 employer match totals an eligible contribution of $33,500. By electing to contribute 34% of her income to after-tax contributions inside the 401(k) plan, she is able to contribute a total of $61,000 to her 401(k) plan. Let us assume the retirement plan prevents additional funding to the 401(k) plan once the after-tax limit of $33,500 is reached. As you can see, Power Employee has contributed significantly more to her 401(k) plan than the $24,500 contribution most individuals are restricted to. **Your 401(k) plan recordkeeper may require whole number contribution percentages, so consideration is required for rounding error. Consult your employer’s Human Resources department if you wish to take advantage of maxing out your full Section 415(c)(1)(A) limits annually. By taking advantage of both strategies Power Employee has supercharged her 401(k) plan contributions. This is exciting on its own, but a regulation declared by the IRS in 2014 (IRS Notice 2014-54) now allows after-tax contributions to be swept into Roth IRAs. This creates a huge planning opportunity for anybody willing to sacrifice a sizable percentage of their income to retirement savings goals. Here's why: Roth IRA contribution limits for 2018 are currently $5,500 for individuals under age 50, and $6,500 if you are age 50 or older. In the above example, if Power Employee sweeps her after-tax contributions into a Roth IRA, she will have contributed $33,500 to her Roth IRA at the end of the year! While most Americans over 50 are limited to contribution limits of $31,000 ($24,500 pre-tax or Roth, and $6,500 to IRAs), Power Employee can ultimately contribute $24,500 into either pre-tax or Roth 401(k), and then supercharge those contributions with another $33,500 of after-tax dollars that can then be directed to her Roth IRA. Furthermore, if Power Employee is feeling extra thrifty, she can make a contribution of $6,500 into her Roth IRA, bringing her Roth contributions to a whopping $40,000. 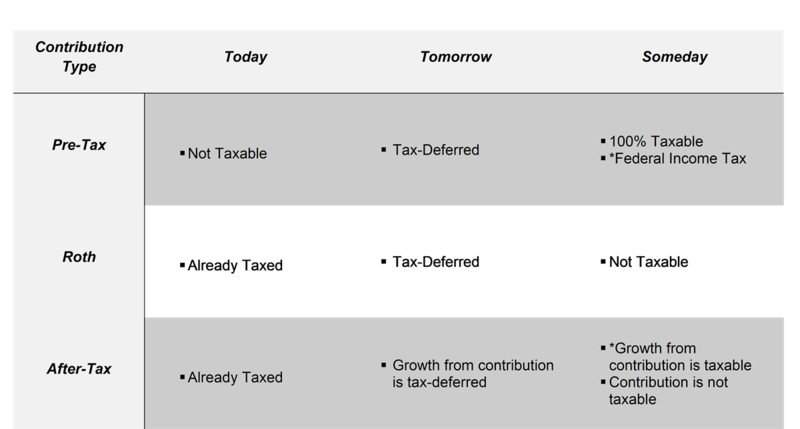 If you are reading this and now realize there are after-tax contributions (not Roth) already in your 401(k) plan, it is worth your time to move these assets into a Roth IRA. After all, any growth that happens within your 401(k) plan will all be taxable to you someday1. Whereas, gains in the Roth IRA, will not be taxable someday1, as long as you adhere to IRS rules. Upon moving your after-tax contributions out of your plan, the after-tax gains must also exit your plan. They can be rolled into a Traditional IRA without having to be taxed. By doing this, you are moving after-tax dollars to a Roth IRA and pre-tax funds to a Traditional IRA. Alternatively, gains from your plan can also go into your Roth IRA/ However, that batch of funds will be taxable to you the year tat you do this, like a Roth conversion would be. This creates a unique opportunity for employees of select companies who wish to maximize their retirement savings in a very tax-conscious way. This strategy requires extremely diligent consideration and should be discussed with your financial and tax professionals prior to execution. A Blakely Walters representative may be able to help you identify whether this strategy fits with your overall financial goals. To schedule a consultation, contact 480-776-5897 or visit www.blakelywalters.com. As Co-Founder of Blakely Walters, Sloan Walters strives to provide clients with the highest level of financial advice, education, and experience. Since establishing the firm, Sloan has been able to help clients enhance their financial independence across a comprehensive menu of services. In addition to his oversight of the firm and its many strategic partnerships, Sloan is a respected guest speaker across a spectrum of financial topics. 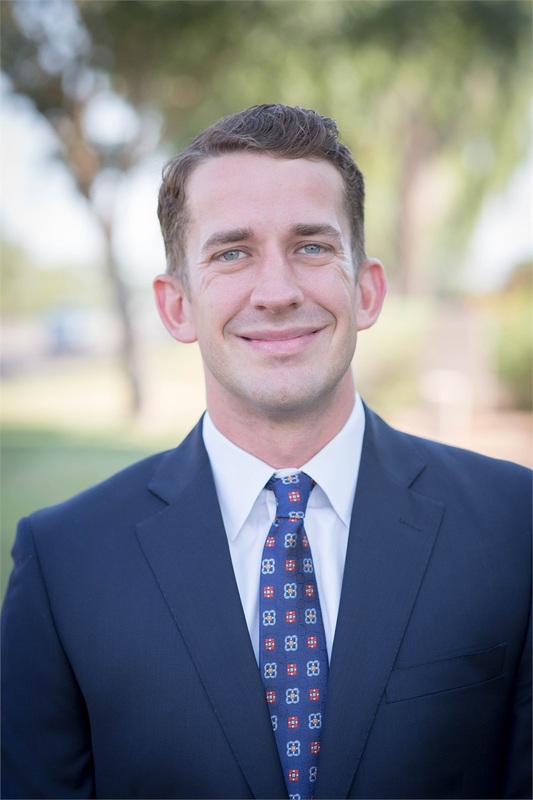 Zachary H. Makawi is a Wealth Manager and Financial Planner at Blakely Walters. His primary job is to listen, learn, and teach in the context of client-facing meetings. 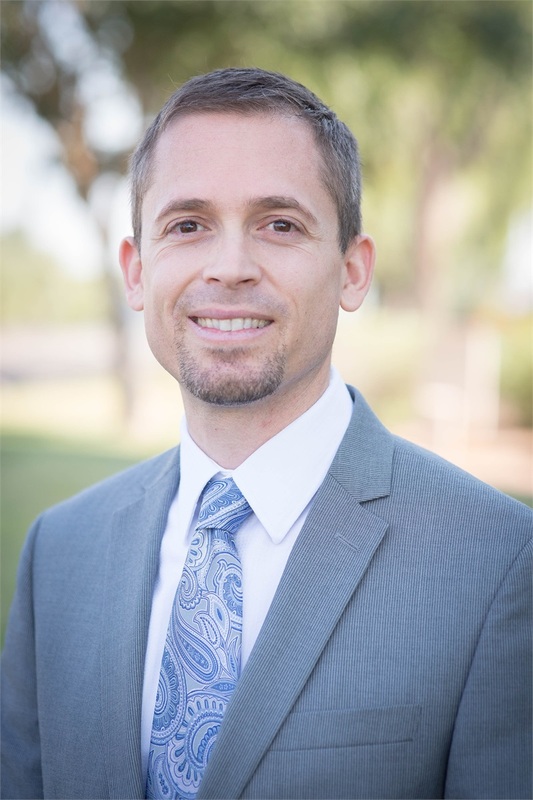 He has met with hundreds of individuals from select employers around the Valley, and as a result, has developed a deep knowledge of their benefits and how to best navigate them. He focuses on forging meaningful client relationships and watching them make progress over time toward their goals. *Securities and Investment Advisory Services offered through NEXT Financial Group Inc., member FINRA and SIPC. Blakely Walters is not an affiliate of NEXT Financial Group Inc. Neither NEXT Financial Group Inc. nor its representatives give tax or legal advice.